Home » auto racing , business , doug smith , economy , nascar , sports , what the hell were they thinking » Is greed killing NASCAR? Not long ago, stock car racing was the most-watched, most profitable professional sport in America and one of the biggest in the world (surpassed internationally only by soccer... or "football" or "futbol" or whatever). Which isn't bad at all for a spectator sport which has humble beginnings in the manufacture and transport of illegal moonshine throughout the southeastern United States. And that is where NASCAR's most faithful and stalwart fans have always been found, along with its most celebrated and capable drivers. Lately however, NASCAR seems to have forgot "who brung them to the dance": those same longtime fans, most of whom have decades of loyalty notched on their belts. Speedway Motorsports' owner and CEO Bruton Smith had this to say last week when it was announced that NASCAR was moving one of Charlotte's races to Las Vegas: "When the game is over, it'll be money, money, money... Money will move it." I've written for several years that I wouldn't be surprised to see Nascar fold by 2020-2025. Or at the very least, there would be races that weren't televised live any more, if at all. Regrettably, there are enough sheep out there to keep the sport alive but I see no reason to change my prediction about Nascar on television because any sport depends on its traditional fanbase to support it in hard times. Nascar's attendance and ratings have been down for years and it can be traced right back to the unholy trinity's concentrated efforts to run off the traditional fans. MLB, NBA, NFL, NHL, Soccer, Tennis, Golf, other auto racing bodies such as Indy and F1, and nearly every other sport I can think of tries at least to innovate but still remaining loyal to their core fanbase. In the case of MLB, I think they try too hard sometimes to do this since it hinders progress that could actually make the game better, but they are at least trying to keep their core fans. Nascar on the other hand doesn't subscribe to this theory. They think that the fairweather fans are the group they need to go after. I'm not saying they shouldn't try to lure in new fans but I am saying that perhaps if they didn't mess with things that worked to draw in fans for over 50 years previously, perhaps they might actually draw in some new fans without running off millions of fans that Bill France Sr and Jr worked for a combined 55 years to draw in. Bruton Smith likes to say things for the sake of saying them to see what kind of things pop up from it. He's kind of a troll, so you have to take what he says with a grain of salt. The drivers in the garage don't even think the race will be moved to Vegas. To be honest, it doesn't really matter to me. 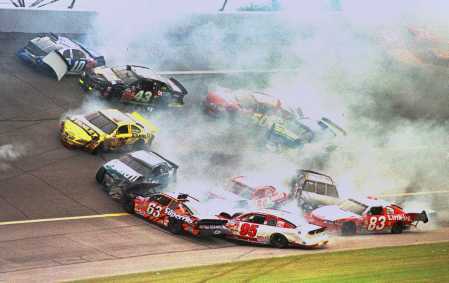 The racing seen at Charlotte and Vegas is similar. What NASCAR needs to do is dump dates of 1.5 milers and tackle more short tracks and road course events, while at the same time decreasing the amount of race dates they have per season. That's the best way to save money, and puts more emphasis on the actual races because there's not as much time to get in the championship hunt, 1 race at a track per season is more special than 2, etc. etc. That being said, NASCAR will continue to do whatever it is they're doing, because they hate change and they hate listening to the core fans even more. They're too busy sucking the teat of Danica Patrick and the crook Rick Hendrick while essentially becoming the Toyota Racing Series. You want real racing, as always, go to your local short tracks, whether they be dirt or pavement, and make your opinions known with your wallet.